Diana Lang’s books, audio programs, webinars, and workshops have allowed thousands to access the physical, psychological, and spiritual benefits of meditation. 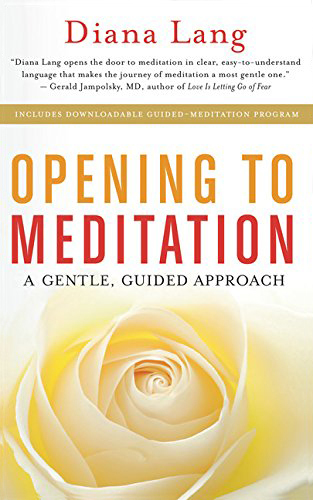 Drawing on her wide experience in studying spiritual teachings from around the world, Lang has put together a gentle, guided approach to meditation that is very easy to implement. In Opening to Meditation, she demonstrates that meditating is as simple as breathing. There is no mystery to it. Her instruction goes to the core, avoiding the analytical theory, fixed rules, and intellectual razzmatazz that often intimidate would-be practitioners. Instead, she shows us how to reconnect with our foundational essence of soul and self, where peace and centeredness are always and everywhere available. Includes downloadable guided-meditation program. To listen, click here.